Simply makes the Angel Ring from Extra Utils 2 be able to be put into the ring slot of Baubles. (As of 0.2.0) You need to craft the bauble version shapelessly in any crafting grid. You can also shapelessly craft back. Inclusion in modpacks is allowed. Any chance we could see a 1.11 port? Can you release a version for 1.11.2 please? I have issue. ExtraUtils 1.2.0, angelRingToBauble-1.10.2-0.2.1.12+45380c9. I was going to post the same thing. I'm glad everyone is up on this, I'm a few days behind atm. v0.2.2 is compatible with ExU2 1.2.0 but makes the bauble uncraftable as the recipes dont work anymore. 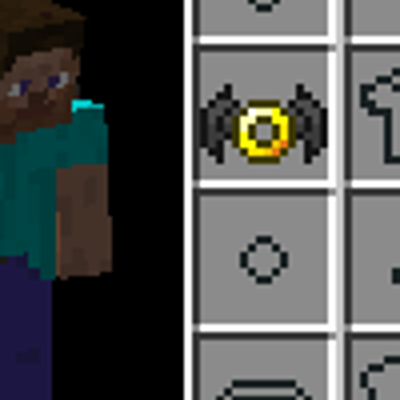 You can use the MineTweaker snippet i posted above to make it work again. I have the same issue with MC 10.0.2, ExU 1.2.1 and AR2B 0.2.3. Try updating extra utilites,if it doesn't work then update the angel ring 2 bauble,doesn't work? Try updating forge,doesn't work? IDK sorry. This would have been awesome to use, however it crashes my client and server. Not sure if you need both reports but here yo u go to be sure. To many letters to post here, posted to pastebin. I get the same crash. I think the root of the issue is that Java cannot find either the Extra Utilities Angel Ring class, or the IBauble interface from Baubles. This kind of error seems to happen in situations like this. Try 0.2.0. If it still crashes try changing the name to start with 'z' (possible loading order problems). Okay, so the client side has been fixed in 0.2.0, however, I haven't tried it on my server as of yet as I don't have access to it at the moment because I had to reinstall my OS. Once I get my system up and running (teamviewer, etc), I will get into my server and test it as well. EDIT: Okay, the client side seem to be fixed now, no more crashing and working, however for the server side, there is no more crashing but I can't get the ring to go into any of the slots for bauble. If it's a loading order issue, you need to fix it yourself. Mod authors can tell forge to run certain loading steps of theirs before and/or after the same step of certain other mods.